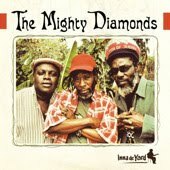 The Mighty Diamonds are the last true survivors of the great era of roots vocal trios. All others have withered, disbanded, or changed their voices. Donald ‘Tabby’ Shaw, Lloyd ‘Judge’ Ferguson, and Fitzroy ‘Bunny’ Simpson never broke up. They have truly stood the test of time, sounding as good today as they did when they formed the group in 1969. 10 tracks of soulful, roots harmony the way the songs were created. All the classics are here including I Need a Roof, Have Mercy, When the Right Time Come, and Country Living. Some tunes are accompanied by Nyahbinghi drums others feature only a guitar. The constant on every track is the sweet, poignant vocals of three gifted singers. The Mighty Diamonds ‘Inna De Yard’ does not disappoint!